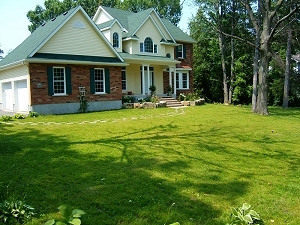 A great lawn is an integral part of a beautiful and functional landscape. 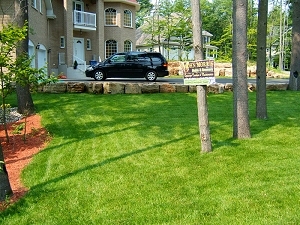 The radiant greenery of a healthy lawn makes every other element in a landscape stand out and look its best. Great grass is also an invaluable play area for youngsters, providing a relatively clean and soft area for them to enjoy. The key to healthy grass is in the preparation. As grass is a living organism, it needs a bed of healthy topsoil to root in. If the underlying soil is sandy in nature, than it will be important to first spread a clay layer before spreading the topsoil. This clay layer will act as a semi-impermeable membrane, and as such retain moisture and nutrients in the rootzone where the grass can profit from them. Also very important in the installation of grass is to ensure that the land slopes correctly to avoid any puddling of water after a rainfall. An irrigation system is always recommended, and is a worthwhile investment to help ensure a healthy lawn year after year. When deciding between seeding and sodding, it is important to remember that to establish a thick lawn by seed requires a minimum of one year, and there is often a large variation in the results as a result of environmental conditions. A lawn that is to be established by seed will be highly susceptible to erosion from heavy rain and contamination from weeds in the first month after it is sewn. If seeding is to be undertaken, the best time to proceed is in August and September when weed competition will be at a minimum. Sodding on the other hand is a much quicker, cleaner, and trouble-free way to go about establishing a healthy lawn.